When removing the sump or carrying out any major work on a three bearing 'Seven' engine I would recommend that you check the copper pipe that feeds the centre crankshaft bearing. I have now looked at, or repaired, around ten engines of which six have had a broken copper pipe. 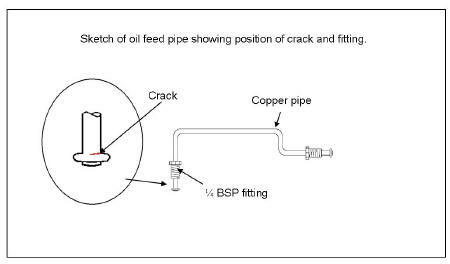 Most of the fractures have occurred where the feed pipe enters the centre bearing. It cannot easily be seen with the naked eye, but can be checked by blowing through the pipe or a blast of air from a compressor. This pipe is important, as if it fails the centre bearing will not be lubricated. The thin metal bearing will wear very quickly and the crank will break. Apparently the 1937 Le Mans Grasshoppers all retired from the race with a fracture of the copper oil feed pipe, so as it happened to the racers it now seems to be happening more frequently with the standard engines; probably due to the age of the copper pipe and the vibrations. Unfortunately, Austin's are not going to have a product recall so we will have to do the check. I am currently looking at replacing this pipe with a flexible braided type which should resolve the problem. The original article, written by Mike Davies, appeared in CA7C Seven Focus in Dec 2012 p22. Having meticulously prepared the Ruby MK2 for the 90th Anniversary Rally in Warwick (July 2012) we set off along the A30 into Devon when, seeing smoke in the cab, there was suddenly a loud bang and we stopped. On lifting the bonnet there was the No 3 Con rod smashed through the crankcase and so the Ruby was returned home by the Recovery Service. That done, and not to miss the rally, we set off again in a modern car. A second hand 3 bearing crankcase in good condition was found amongst the traders at the rally. Back home the engine was removed and in amongst the wreckage of the engine lay a nylock nut without a nylon insertion. The big end bolt had come undone and hence the con-rod had shattered the crankcase. When the engine was stripped down it was found that the olive on the copper feed pipe to the centre bearing had broken off. This resulted in the bearing overheating and melting the nylock on the no 3 cylinder. I would suggest those ‘Seven’ owners with a 3 bearing crank engine check the copper pipe that feed the centre main bearing, just as it says in December’s Focus. 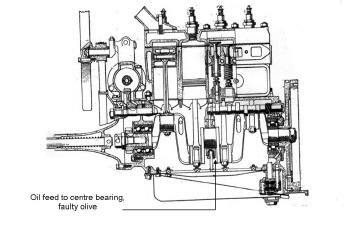 This is a sequel to the articles in the recent December and January editions of Focus relating to the oil feed pipe for the centre bearing on the three bearing engine. You may recall the sad picture of the big hole in the side of Ian Leaver’s Seven and the description by Ian and Mike Davies of how it all came about. Mike showed that the root cause was a fracture of this copper pipe at the point where it enters the bearing cap and commented that he has found that six out of ten engines he has worked on had failed oil pipes! Because the pipe remains in situ, the separation where it enters the cap may not be immediately obvious, e.g. when taking the sump off for some other task. Being in the middle of an engine rebuild these warnings were very timely. Presuming that the failure was due to work hardening of the copper, I set about annealing a couple of these pipes by heating to red heat and quenching. I needed two goes at it so as to shuffle along the back nuts which masked some of the first effort. I burnished up the copper with some steel wool and then did a double take! With no effort at all, the end had completely come off as shown in the picture. Here was another accident waiting to happen! There is definitely a need for a detailed check. Removing the pipe from the crankcase is not straightforward unless you have cranked spanner. The picture shows “the one I made earlier”. An old spanner was taken to red heat and whacked around to the shape shown. Then with an angle grinder and finally with a file the jaws were made 0.82" and 0.60" wide. 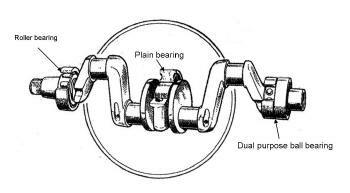 The larger size jaw is to undo the threaded union (also shown in the picture) which is at the feed end of the pipe. It may be helpful to back it if off at the same time as slackening off the back nuts to remove the feed pipe. It is worth noting that the removal of this pipe and union is one of the earlier tasks when you are stripping the bottom end of a three bearing engine, so such a spanner is an important part of your kit. 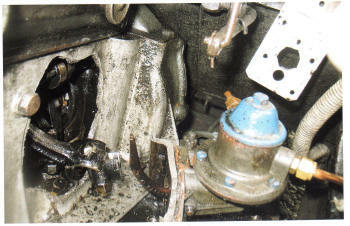 As an aside, do not attempt in an engine strip-down, to remove the banjo bolt (the one hidden behind the flywheel) and to which this union is bolted, without removing the union first. The original article, written by Ron Hayhurst, appeared in CA7C Seven Focus in March 2013 pp18-19.